Browsing and merchandising both are enhanced with this Gooseneck Overhead Sign Arm Header. 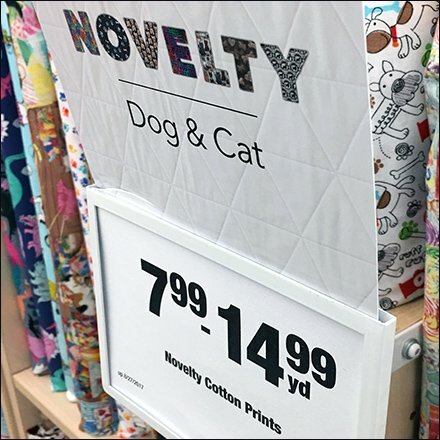 The Gooseneck Sign Arm does not interfere in the least with addition of a fabric category Header to the standard Sign Holder below. In fact the upward extension of the Gooseneck Sign Arm provides some back support to the Header. Consider this Gooseneck Overhead Sign Arm Header from various angles in the gallery of images. Seen at JoAnn Fabric and Crafts.